We navigate upstream in dugout canoes. A man with an outboard motor is in the back, man-with-a-stick up front. Quite a few times the motor is found useless and the man with the pole at the helm literally pulls us by sheer brute strength toward our destination. I am sitting with a random mix of travelers from many different countries, only one of whom I knew before this adventure began. Our destination is a village. On my left is Panama, on my right is Costa Rica. We are in the middle of two countries but I get the feeling we’re also caught in the middle of two worlds. I am fearless in so many ways but admittedly I wonder what lurks under the brown water that laps almost to the top of our canoe. Snakes? Alligators? My hands stay in my lap. Around me, several different forms of Spanish language and English melt into a sort of song that forms the backdrop of our journey up the river. Locals call this entire country, “the happiest place on earth” and I am here because I won a trip to suss out for myself how true that statement is. Whoever made my itinerary thought that seeing Costa Rica beyond the walls of a resort was imperative to my education. I know the thoughts swirling in my head are the currency of cliché. We’re headed toward a Bri Bri village. I don’t know what that means so I picture dark-skinned natives in grass skirts and in the same thought, shake my head at my own stupidity even while wondering – if I am wrong, what will we really find? It could be anything. The itinerary didn’t fully prep us on what lies in wait after our canoes find purchase on land once more and deposit us into another jungle. I know from the conversations in the canoe, that the Bri Bri people have cell phones but no electricity for lights, cooking or appliances. No washer and dryer. No TV. Their cell phones connect them to an outside world they cannot drive to meet. And these aren’t smart devices like the iPhone I have in my dry bag; these are the type I had more than a decade ago in college, whose charge lasted a week. This river is their highway, and their isolation – which is lessening more and more. I have all the bars of a 3G signal yet my battery will likely die before my visit to the village concludes. 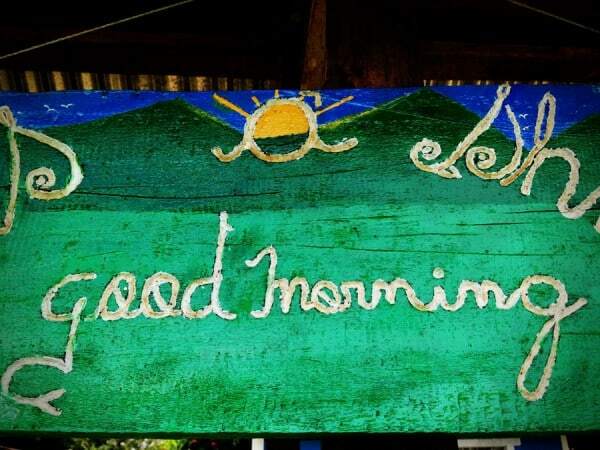 Here, on the remote border of Panama and Costa Rica, I find myself bewildered by contradictions yet with a mind like a blank slate waiting for chalk. My eyes drift down to the brown water again, then up to the tree line that is Panama. Is that the portion of the country always so embroiled in a drug war? Maybe I’d prefer the snakes. Perhaps an hour passes, I later find out it’s almost two, before we discover a break in the trees and a very steeply inclined path that disappears into thick vegetation. After struggling out of the canoe, mud almost immediately covers my sandal-clad feet and shins. Each step is a struggle. While I “walk”, I ponder our guides beating a path before me. They are husband and wife, dressed not unlike me though with even less fashion sense that I possess. The wife, Miriam, wears a t-shirt with applique kittens on it. Neither Bri Bri speaks any English. I recall conversations with friends before I departed, in which I was told I didn’t need to learn Spanish, “Everyone speaks English where you’re going.” I smile. Clearly this is not the place my friends envisioned. I wonder again how today made its way onto the itinerary. My eyes are large, taking in the cacao trees, thatch-covered dwellings and stray dogs or chickens that seem to forever nip at the ground around us. My eyes hurt with the energy of trying not to miss a thing. I feel this isolation yet connection as I use my iPhone to craft an image of the Village’s school. I see the waning battery and make a mental note as I notice we’ve arrived. Whatever clichés filled my head fail to match what I am seeing – on this, the edge of Costa Rica, on the border of Panama. There’s a clear fence, taller than the Bri Bri and a sign that I assume marks the name of this village: Stibrawpa. All the natives I can see are dressed similarly to Miriam. All, are smiling at us. There are no grass skirts in sight. I note, with envy, everyone has practical wellies to combat the mud. 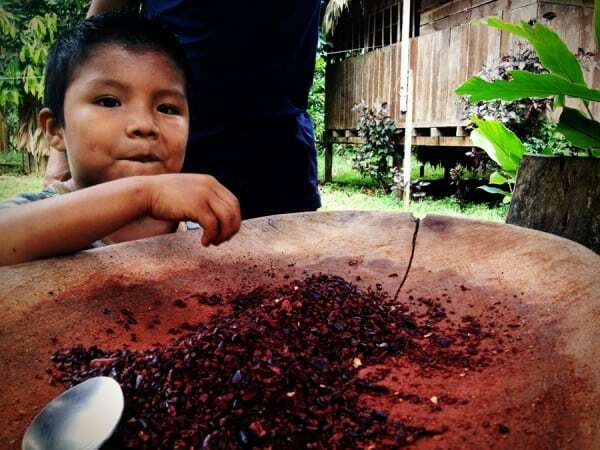 I will later learn that the Bri Bri are an indigenous people who speak their own language separate from Spanish and who have always subsisted on agriculture. Technology and the encroaching outside world is forcing a change to their way of life whether they are ready for it or not. Hence, cell phones and western clothing. However, they are determined to change as little as possible so they still maintain a daily existence that forgoes advancements like electricity. They will be paid for welcoming us into their village, for feeding us a traditional meal. This, is a new form of income for them and a type of experiment with the more advanced world. I wonder how long this tentative partnership can last before the Bri Bri way of life is altered irrevocably and certainly, not for the better. 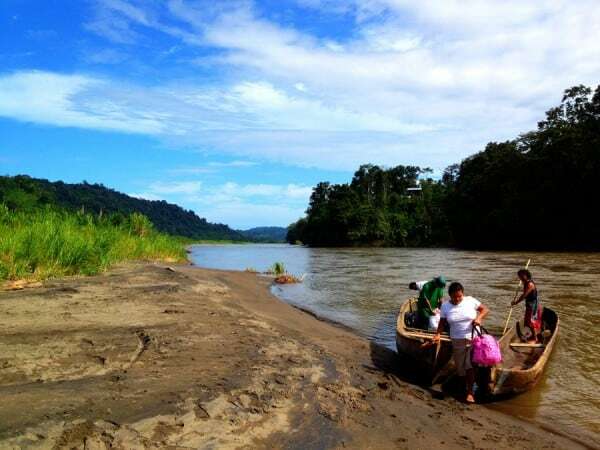 From our disembarkation spot at the river to the bank of a creek, we walk perhaps a few miles inland, sheltered the entire way by cacao trees. It’s as if we’re on an island. I’m told the bridge that crosses the creek we come across, leads to Panama. Again. For a moment I feel out of sorts, stronger this time – as if perhaps I’m in an episode of LOST. I look around for an activity that might stop my thoughts from tumbling around so much. It’s exhausting. Across a small clearing, a smiling Bri Bri man is beckoning me. He’d like to teach me archery. Somewhat skeptically, I approach and examine the “bow” and “arrow” he holds. Then, in a manner not unlike that of a bull in a china shop, I grab the items and make aim for a small cacao pod hanging by a string from a nearby tree. Three times I repeat the process that is similar to the one I learned at summer camp. Twice, my arrow finds its target and I smile. There’s no smugness. My success is surely due to luck alone and I inwardly hope no one asks me to repeat my triumph a fourth time. When I look around I notice no one but my teacher has seen my anyway. The fellow travelers in my group and the Bri Bri are now clustered around a larger than normal thatch roof building on yet another side of the clearing. As I make my way toward the building I have no idea just how surreal things are about to become. I spot Max before I see the mural he is working on, the children clustered around him or the Tibetan prayer flags that hang haphazardly from the rafters. They’re out of place almost more than any other element of the scene I take in. They, of course, belong to Max. If the travelers in my group are from another world, Max is from another universe. Barefoot and bare-chested, tanned but very clearly white, blonde, dreadlocked hair and covered in paint splatter with necklaces that include a Star of David around his neck – I know immediately who this kid is. An art student, in this case, one from the Rhode Island School of Art & Design. Max wastes no time introducing himself and his senior thesis theory of: Artolution. His entire speech is captured on videotape by a fellow student who is on this journey as his assistant. They are fresh off a trip around the world, just back from New Zealand. 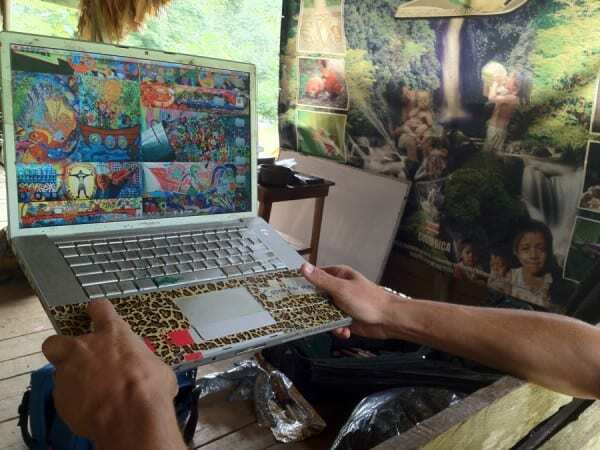 Max is going through tribal cultures creating murals, purportedly with native children, so as to preserve their art. He shows us past murals created in other countries along with his art from early years at RISD. It is, unsurprisingly, all the same. He has a signature, loose and very modern style that weaves through every piece he shows us. He boldly notes that galleries in cities like New York already love his work and that of the children, and pay handsomely for it. He questions some of our party on their philosophies of art, asks how we are healing the world, espouses his Artolution theory again. Max tells us that the world has had enough revolution, enough war, enough talking, enough politically motivated change. Art, will heal the world. I’ve long since turned my direct attention away from the soapbox to actually watch the children and adult Bri Bri. Though they welcomed him into their village days before us, and have let him stay, they look at Max similar to the way they look at us – as outsiders. It is not us who have come to spy upon them, but we who are the spied upon. The expensive, professional-grade video equipment, Apple laptop, acrylic paints, archival canvas, especially the ArtDude suit that Max wears with a Mickey Mouse face mask all seem so garishly out of place that I can do nothing save shake my head. A Disney character will change their world, for the better? There’s a shift in mood and I see that a chocolate-making demonstration is beginning. From raw, sinuous and slime-covered cacao pods to a thick ground paste, we witness the process of creating what we know as milk chocolate. A can of condensed milk is produced, mixed with the cacao paste and we are urged to dip our fingers in and taste. I obey and am rewarded with a flavor so pure, slightly sweet and stunning in my mouth that I am again, speechless. Impressed but easily bored, our group moves away and I stand, dipping my finger again and again into the dark, brown liquid. A bell rings signaling us for lunch. Dessert may have come first but the real meal is waiting. 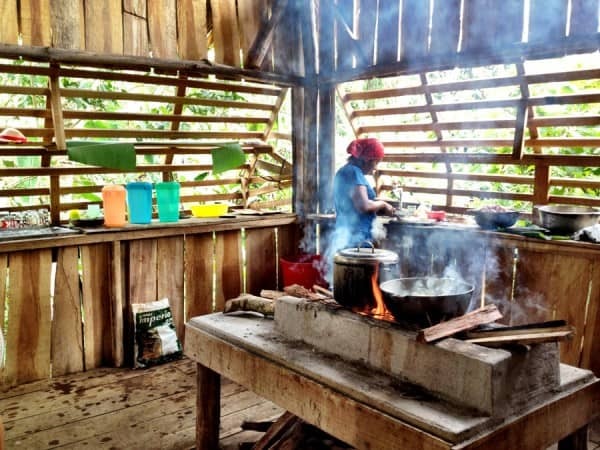 Over an open wood fire with a complete absence of the sort of utensils most cooks would except to use, the women of the village happily slaved to cook us a meal of pounded chicken, hearts of palm, rice and beans. The same chickens were just hours ago clucking at my feet. I try to forget that detail as I dig in. After destroying the plate put before me, I exchange a glance with another member of my party and see in their face some of the confusion that must be present in my own. This simple meal, enjoyed amongst strangers, is truly one of the best of either of our lives. Before I can fully wrap my head around why I love the food so much, before I have even digested the chicken – it’s our time to leave the village. The same struggle through mud, the same stray animals (albeit, down a few in number), the same cacao groves seem to fly by this time. We’re already pros at navigating this other world. Or maybe we are merely in a hurry to return to ours before we find ourselves too content with the simplicity of this space on the border of two countries, so far from our world. During the canoe ride back to electricity and our type of civilization, I surrender to my complicated head-space. Taking in all I experienced, colored by all I know, I feel uncertain that either Max, myself or any member of my party belonged in that Bri Bri village. For any amount of time. Too often we think that we are the salvation and saving grace of a world tumbling into some sort of physical or metaphorical void. If I remove all of us from the equation, what I see is a happy people living a simple life utterly devoid of the need for any saving. What will our money bring them that they do not already posses? What will Max’s art do for them when it is not preserving anything they already produce? Is it not simply introducing new systems they cannot afford to maintain? I fail to find answers during the trip downstream. It is twice as fast this time, going with, and not against, the current. Perhaps the freshest food and sweetest chocolate I have ever enjoyed is simply playing tricks with my head. Perhaps I have not simply visited the space between two countries but have in fact, fallen over the edge. As if to signal the change, my hand dips into the cold, white caps of the brown river and not a hint of fear (or of snakes) runs through my mind. Thank you for giving me a platform to share this story, Abigail! Pff! Thank you very much for sharing it! I was on that journey, and I can also add they raised bananas which were the best I have ever tasted. Since they have no refrigeration, the condensed milk is well used. The rivers in Costa Rica are fantastic. What a great post…I’ve been dying to go to Costa Rica to visit Arenal, but i never for once dreamed of going down the river. Lovely post, Kirsten! Wow what a cool way and hands on way to experience Costa Rica. 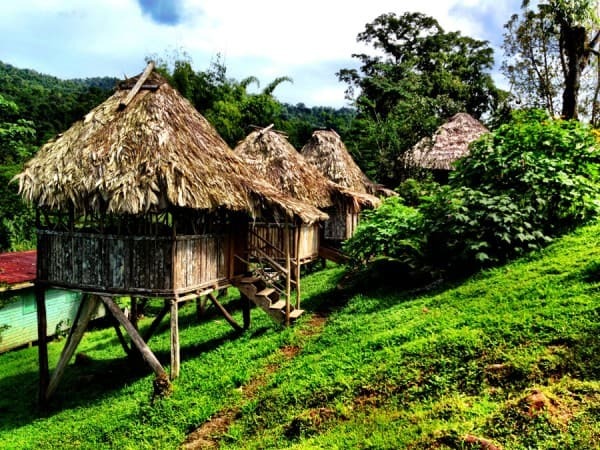 Thanks for sharing this post about your experience….makes me want to visit the Bri Bri Village!